Next up, we have BP Capital. 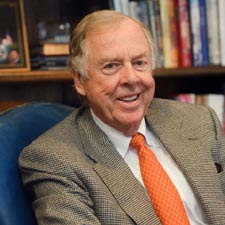 With all the commotion surrounding energy these days, it never hurts to track an energy focused hedge fund ran by none other than Boone Pickens. If you are unfamiliar with Pickens, he is an energy maverick and his fund returned 300% in 2005. He is a big advocate of Peak Oil Theory and runs an energy-centric hedge fund based in Dallas, Texas. Although he typically holds numerous positions in oil, he is also big on alternative energy (except ethanol). We haven't covered Boone in our last few portfolio tracking series because his fund had been facing major problems and moved pretty much to cash. In fact, he was one of the top hedge fund losers of 2008. His energy/commodity fund was down around 60-80% at various times as he continually mistepped in the oil markets. Back in October, we noted that Boone was seeing massive investor redemption requests. This came after our report in September of last year noting that his funds were down huge for that year. Needless to say, 2009 will be a rebuilding year for Boone and his BP Capital Management. Amazingly, Boone did still manage to land himself on Forbes' billionaire list though. To see what BP's portfolio would normally look like when fully invested, then check out their past holdings here. Over the course of last year, he advocated a large natural gas position and additionally made a big bet on wind energy as America's future. Outside of investing in it, he also has been a big proponent for energy change as America looks for new alternatives. He's pushing for energy independence with his Pickens Plan which initially picked up a lot of steam around the Presidential election, but has slowly tapered off and we haven't heard a whole lot from it recently. In terms of more recent energy prophecies, Boone has said he could see oil settling around $75 in the intermediate-term as the economy tries to recover. The following were BP's long equity, note, and options holdings as of March 31st, 2009 as filed with the SEC. We have not detailed the changes to every single position in this update, but we have covered all the major moves. All holdings are common stock unless otherwise denoted. Pickens holds his typical plays, as his portfolio really hasn't changed. The equity holdings above were pretty much the same ones he held before facing massive redemptions at his hedge fund. So, even though there a bunch of names listed under the 'new' category, they aren't really new holdings. They are, for the most part, the same plays that he had before his liquidity crunch. Keep in mind too that Pickens' portfolio is pretty small these days. Assets from the collective holdings reported to the SEC via 13F filing were a little over $93 million this quarter compared to $40 million last quarter. He's definitely started to put some money back to work, but it is nowhere near the asset levels he used to have (around $2 billion). As we said before, it will be a re-building year and we've started tracking him again because, let's face it, he'll be back. Investors always flock back to fallen fund managers and we really have no clue why. If anything, we can at least chronicle any shenanigans that might ensue. This is just one of the 40+ prominent funds that we'll be covering in our hedge fund Q1 2009 portfolio series. Check back each day as we cover new fund portfolios. We've already covered Andreas Halvorsen's Viking Global, John Paulson's hedge fund Paulson & Co, Stephen Mandel's Lone Pine Capital, Eric Mindich's Eton Park Capital, John Griffin's Blue Ridge Capital, and David Einhorn's Greenlight Capital, Seth Klarman's Baupost Group, Timothy Barakett's Atticus Capital, Lee Ainslie's Maverick Capital, Raj Rajaratnam's Galleon Group, Shumway Capital Partners (Chris Shumway), and Bret Barakett's Tremblant Capital Group.